Young Jacques Plante's way of playing hockey may look different from everyone else's. Instead of a puck, he uses a tennis ball, and his shin pads are made out of potato sacks and wooden slats. But that's not going to stop him. He loves the game. Jacques is drafted by the Montreal Canadiens in his mid-twenties. Fans love the unstoppable goalie as he leads his team to one victory after another. But there's a price to pay: pucks to the face result in a broken jaw, broken cheekbones, multiple stitches, and even a skull fracture. One day, Jacques has had enough. He goes on the ice wearing a fiberglass mask. The coach orders him to take it off. 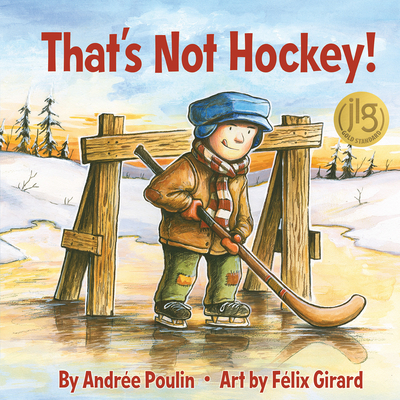 Finally, at a game against the New York Rangers, when yet another puck hits Jacques square in the face, he puts his foot down. He will not continue to play unless he's allowed to wear a mask. Young hockey fans will enjoy this story of Jacques Plante, whose determination and love of the game brought about a revolutionary change to how it is played.